Yesterday brought me no less than two très belles coïncidences. First – as I told yesterday – the issue of Le Monde I got on the Air France flight had assigned a whole page to my research object, the very reason for which I was coming down to France again this week; the French slam scene. (Today it’s Libération’s turn). The second coincidence was almost as belle; as I strolled around in my beloved Belleville/Ménilmontant neighbourhood I spotted a poster in a window announcing that the historian Pascal Blanchard, coeditor of La fracture coloniale, was having at talk at the local library 2 hours later. La fracture coloniale was in fact the very book I decided at the last moment not to bring with me here, as I would have little time for reading, - but which I’ll have to read as soon as I get back, since I’m writing an essay on the current struggle over history going on here. I’m back in Paris for 9 days, and this time I’ve settled right in the heart of Belleville, in the Tunisian Jewish neighbourhood (where they’re just about to celebrate Yom Kippur, I think…). A few blocks from the hotel, I’ve found a café with wifi – a café where they also arrange slam sessions, which of course fits perfectly with my intention to get some intensive fieldworking done while I’m here. So, now I sit blogging right at my favourite boulevard (Café Cheri(e) is undoubtedly quite trendy now, and it has in fact it's own blog...). And talking about intensive fieldworking; while I’m here I can keep myself occupied every night with going to various slam sessions, and these 9 days of intensive focus on slamming started really well as I opened Le Monde (1-2/10/06) on the plane and found that they had dedicated a whole page to the French slam scene! Time is overripe for finding out more about slam poetry, the phenomenon by way of which I’ll try to understand and describe La France Métissée. 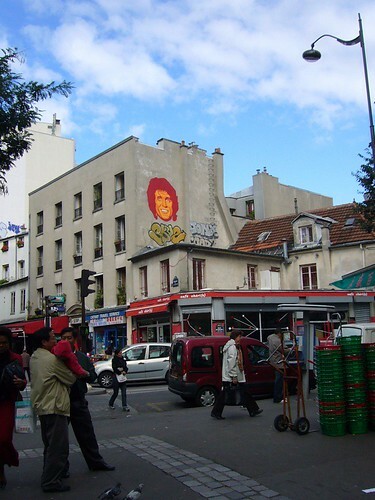 I bumped into the Parisian slam scene with almost no prior knowledge, and for two months I hung around at various slam soirées in eastern Paris and her hot suburbs, just experiencing what was going on. In the second part of my presentation, I moved on to the particular field where I hung around and conducted anthropological fieldwork proper; thus participated as I observed or vice versa. As some will already know, that field is a slam poetry scene in Paris. I’ve written about it here already, and I’ll surely return to it, so I’ve not found it worth translating that part of my presentation here. Instead, I’ll reflect a little around the comparison I’m intending to make between the slam poetry phenomenon in Paris and the cultural expressions which constituted a core element in my study in London. In the third and final part of this post, I’ll try to recall the questions I got after my presentation. Each time I tell about my fieldwork, I end up saying different things to different people, and usually I feel that it turns out quite messy, whatever I say. That was certainly the case when I tried to sum up the main points to my supervisor. So before my first seminar presentation (in front of a small multidisciplinary audience), the time had come to structure all I had experienced neatly into a comprehensible – and hopefully quite comprehensive – format. My presentation was almost purely empirical, as I’ve not been reading much else than newspapers the last 9 months. The structuring principle I chose was to first give a socio-political overview of the bigger social events that took place during my fieldwork (October 05 to July 06), before I shifted to a more concrete micro focus on what and whom I’ll focus my research on (due to a need to anonymize at the web, I’ll be a little less concrete in this English version). I see the major socio-political events as forming a backdrop to my ethnographic micro focus, which – I hope – in turn can contribute to the understanding of these larger events. The first part of this post gives an English version of the first, events focuses, part of my presentation. The next part moves on to the micro focus, with a few words on my intended comparison with London as well as an attempt to sum up some of the comments I got after my presentation. 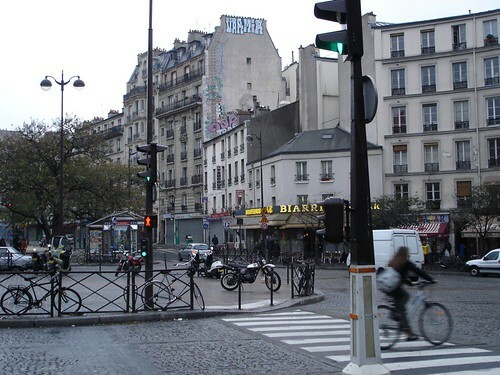 Since October 2005, I’ve been blogging from my fieldwork experiences right amongst the Parisians, but from now on this is - hélas – no longer the case. I’ve returned to Oslo with all my fieldnotes, photos, impressions and sentiments, and after living and working autonomously for 10 months, I’m now trying to reintegrate into the office environment (as well as my Oslo life). Since my intention with this blog has been to document not only how my fieldwork developed, but also the rest of the research process, I’ll try to keep on blogging from the office. Another warm night, and it seems like insomnia strikes again despite however little storm and poèsie infused sleep I had last night. I’ve been too snotty to go to the jazz concert in Parc Floral and hang around somewhere in East Paris until the early hours, as would have been suitable for this hot Saturday. And I regret it a lot, especially since it’s my second last weekend here (and only three more jazz concerts to go, amongst all the other things I’ll be missing...). Instead I make use of my sleeplessness to finish a blog post I’ve been planning for months.